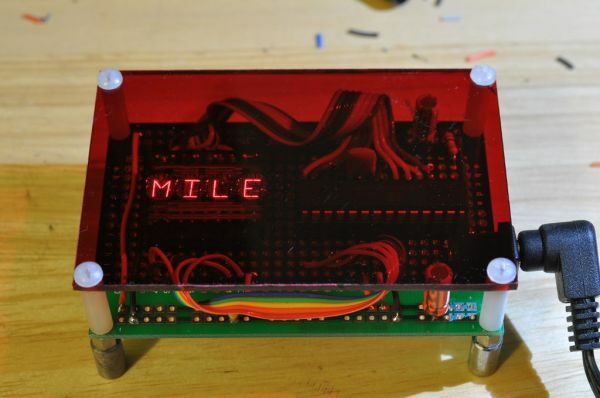 Build an Arduino-powered version of the “Four Letter Word Generator” (FLW). This version generates “words” on the fly – it does not use a list. The “original” version from the 1970’s used B7971 nixie alphanumeric tubes. These tubes are getting hard to find and they’re certainly expensive. They also require interfacing with high voltage and an understanding of multiplexing. This version uses a slightly more modern and easier to use display while maintaining the overall glowy, multi-segment look of the original. The Siemens DL2146T is a 4-character, 16-segment (plus dot) intelligent display. It has built-in drive and an ASCII font table. You basically send it seven bits of ASCII along with a couple more bits that select the position and control reset, blanking and chip select. It uses “a lot” of pins but we’re not doing anything else so the available outputs on a ATMEGA168 are plenty. An Arduino beginner with good soldering skills should be able to complete this. This is an obsolete part, but it is generally available. You should pay less than $20 USD for it. Buy this wherever you get the best price. You can get it with the bootloader already installed if you want. An ATMEGA328 will work but is overkill. An ATMEGA8 might also work but I have not personally tried it. Feel free to use whatever you want, but this is a great quality protoboard and it is cheap, esp. if you buy a five-pack. This board is double-sided, real fiberglass, tinned and all the holes are through-hole-plated. You’ll appreciate how nicely it solders and how well you can unsolder without ripping up pads. Try jameco.com for this one; it’s not mandatory but the colors help keep you from messing up the bus wiring. is so much more efficien and they are cheap, so I no longer bother. Make sure to observe the polarity of your adaptor. Most use center positive. Adapt your wiring for the jack if necessary. Ebay is the best option here. – hook-up wire – solid core is easiest but consider looking into teflon-insulated wire – costs more, harder to strip but it does not shrink or melt when soldering. 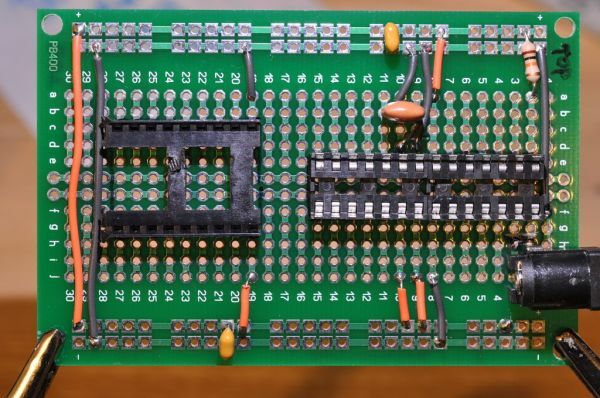 Here’s the original as developed on a breadboard with jumpers. The Arduino is an Adafruit Boardiuno kit. It’s meant to plug right into a breadboard. It works very well for that purpose. The flexible jumper wires are also a worthwhile investment. The following few steps are optional but they improve the look of the display. If you want the display filter, do it now before you solder anything to the board. Otherwise you won’t be able to use the board as a template, unless you bought more than one.